Scholars Week celebrates the culture of scholarship, research, and creative endeavors on campus. 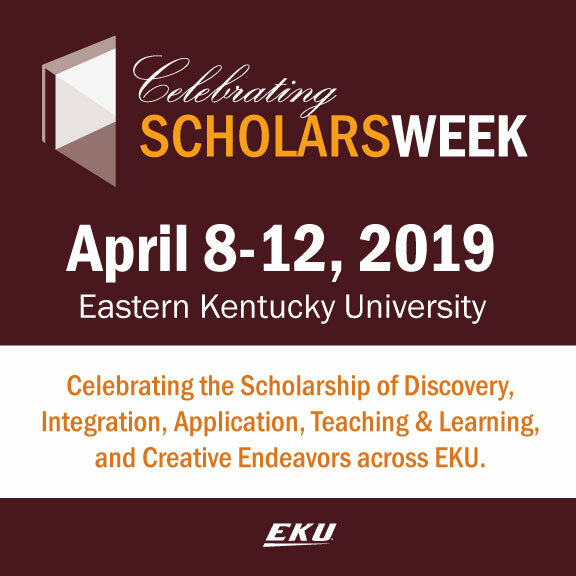 The week begins on April 8, 2019 and includes a diverse series of events highlighting the scholarship and creativity of students and their faculty mentors at Eastern Kentucky University. Held annually every April, Scholars Week celebrates, showcases, and promotes the rich culture of faculty, student, and faculty-student scholarship, research, and creative endeavors. As such, Scholars Week supports the EKU University Strategic Plan 2020, especially 1.1.3: "Increase opportunities for faculty scholarship, research and creative endeavors, and faculty-student collaborations;" and 1.2.3: "Provide students the opportunity and support to participate in and receive recognition for research, creative, and academic endeavors." Students in the Honors program will give their thesis presentations. All members of the EKU community are welcome to attend.